Flipps Media has announced that it will stream the May 6th super fight between Saul “Canelo” Alvarez and Julio Cesar “JC” Chavez, Jr., live on pay per view in the United States and Canada, starting at 9 p.m. ET / 6 p.m. PT, from sold-out T-Mobile Arena in Las Vegas, Nevada. “Canelo vs. Chavez, Jr.”, promoted by Golden Boy Promotions, is available to watch in HD in English and Spanish on the Canelo-Chavez.com website for a suggested retail price of $69.99. Boxing fans can watch the entire PPV card, headlined by the Alvarez-Chavez, Jr. 12-round fight being contested at a catch-weight of 164 ½ pounds, live at www.canelo-chavez.com from any computer or mobile device. All supporting events including the Canelo vs. Chavez Jr. press conference, weigh-in, and undercard fights will be streamed live globally free on the Canelo-Chavez.com website, the FITE.tv web site and on the FITE app available for iOS and Android devices. “Our team here at Golden Boy Promotions has been working with Flipps Media for over a year now and we are thrilled that they are helping make this ‘can’t miss fight’ available to an even wider boxing fan base,” said Golden Boy Promotions Founder and CEO, Oscar De La Hoya. The “Canelo vs. Chavez, Jr.” PPV card is loaded with exciting knockout artists, with eight of the main card fighters having a combined record of 272-18-2 with 194 knockouts, highlighted by the Alvarez-Chavez, Jr. cumulative record of 98-3-2 with 66 stoppages. Alvarez vs. Chavez, Jr. is one of the most anticipated fights, easily a Fight of the Year candidate, featuring two of the highest-profile Mexican warriors, fighting on Cinco de Mayo weekend. Twenty-six year-old Alvarez (40-1-1, 34 KOs) is the reigning World Boxing Organization (WBO) world junior middleweight and The Ring magazine middleweight champion. The wildly popular fighter is moving up in weight to fight Chavez, Jr., who has dropped back down from light heavyweight. Alvarez is 10-1 (6 KOs) in world title bouts, in addition to being 11-1 (4 KOs) in fights against current or past world champions: Shane Mosley, Miguel Cotto, Amir Khan, Miguel Vasquez (twice), Carlos Manuel Baldomir, Lovemore N’dou, Kermit Cintron, Austin Trout, Erislandy Lara and Liam Smith. The son of legendary Hall of Famer Julio Cesar Chavez, Chavez, Jr. (50-2-1, 32 KOs) is a former World Boxing Council (WBC) middleweight world champion. He has defeated world champions such as Carlos Molina, Sebastian Zbik and Andy Lee during his 13 ½ year professional career. In his first pro loss, Chavez Jr. lost a 12-round decision to Sergio Gabriel Martinez, who survived a final round knockdown as Chavez tried to finish off the famed Argentinian. The 10-round co-feature also has explosive potential as middleweights David Lemieux (37-3, 33 KOs) and Marcos “Dorado” Reyes (35-4, 26 KOs) have a higher combined knockout percentage than Alvarez-Chavez. Jr.
Lemieux, 28, is a highly skilledfighter from Montreal and a former International Boxing Federation (IBF) middleweight world champion. He is 12-1 in his last 13 fights, since his loss to unified world middleweight champion Gennady “GGG” Golovkin. At stake for Lemieux is a possible throw-down with “Canelo” later this year. The Canadian slugger has quality victories over Curtis Stevens, Hassan N’Dam N’Jikam, Gabe Rosado, Fernando Guerrero. Lemieux is currently world rated among the top seven middleweights by all four major sanctioning bodies – WBO & WBC #4, WBA #5 and IBF #7 — as well as No. 3 by (independent) The Ring. Reyes, fighting out of Chihuahua, Mexico, went thedistance in 2015 with Chavez, Jr., in a loss by way of 10-round unanimous decision. Reyes is a former WBC FECOMBOX middleweight and Mexican light middleweight champion. Former Interim WBC super lightweight champion Lucas “La Maquina” Matthysse (37-4, 34 KOs) returns to action for the first time since October 3, 2015 against Maryland welterweight Emmanuel “Tranzformer” Taylor (20-4, 14 KOs). Taylor was a decorated American amateur boxer who owned a 186-26 amateur record, including three gold-medal performances in the National PAL Championships. The 26-year-old has never been stopped as a professional, taking world champions Adrian Broner and Chris Algieri the distance. Taylor has defeated Karim Mayfield, Victor Manuel Cayo and Raymond Serrano, among the more notables. Rising featherweight star Joseph “JoJo” Diaz, Jr. faces fellow undefeated Californian Manuel Avila in a 10-round bout with future world title fight implications. The 24-year-old Diaz, Jr. (23-0, 13 KOs), a 2012 U.S. Olympian, is the North American Boxing Federation (NABF) featherweight champion. He is the No. 2 contenders in the WBC and WBO world ratings, as well as No. 7 in the IBF. His most recent fight was a win by a 10-round unanimous decision (100-90 X 3) over 30-1-1 Horacio Garcia last December. Avila, rated No. 10 by the WBC, is a live underdog having defeated 28-6 Jose Ramirez, 24-7 Prosper Ankrah and 23-6 Rene Alvarado in his last three fights. HBO Sports is the Fight Fan’s Destination for Canelo vs. Chavez, Jr.
HBO Sports is the fight fan’s destination for Canelo Alvarez vs. Julio Cesar Chavez, Jr. fight week news and information, providing viewers with an in-depth look across television, digital and social platforms at the blockbuster event set for Saturday, May 6 at the T-Mobile Arena in Las Vegas. The mega-event will be produced and distributed live by HBO Pay-Per-View® beginning at 9:00 p.m. ET/6:00 p.m. PT. Fans will have access to original programming, specials, updates from HBO Boxing Insiders and exclusive videos leading up to fight night. There will also be behind-the-scenes photos, videos, live streams and other customized content available. Boxing fans can also view Canelo vs. Cotto 2015 and Chavez, Jr. vs. Lee 2012. These classic fights are available on HBO On Demand, HBO GO, HBO NOW, HBO.com and YouTube.com/HBOBoxing as well as affiliate portals. 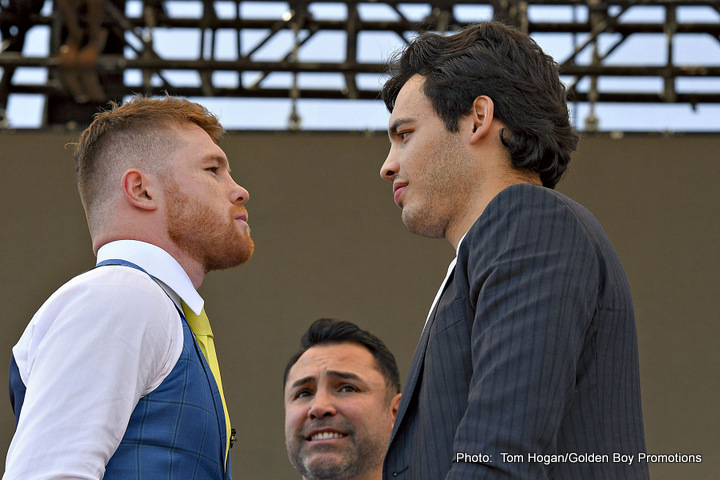 Canelo vs. Chavez, Jr. takes place Saturday, May 6 from the T-Mobile Arena in Las Vegas and will be produced and distributed live by HBO Pay-Per-View beginning at 9:00 p.m. ET/ 6:00 p.m. PT. “Mano-A-Mano: The Battle for Mexico” to air on ESPN 2 and ESPN Deportes This Week Featuring Canelo Alvarez and Julio Cesar Chavez, Jr.
LOS ANGELES (May 1, 2017) – The Golden Boy Media and Entertainment production of “Mano-A-Mano: The Battle for Mexico” will air this week on ESPN 2 and ESPN Deportes as part of the lead up to the Canelo vs. Chavez, Jr.
“We are very excited to further our partnership with ESPN by having Mano-A-Mano air across the ESPN family of networks as part of the lead up to the Canelo vs. Chavez, Jr. mega fight on Saturday, May 6. We’ve had a successful start to the Golden Boy Boxing on ESPN series, and this is just the next step in what we hope to be a long partnership with ESPN” said Oscar De La Hoya, executive producer of “Mano-A-Mano” and chairman and CEO of Golden Boy Promotions. Photos and videos are available for download by clicking here or copying and pasting the link www.bit.ly/Canelo-ChavezJr into a browser. Credit must be given to Golden Boy Promotions for photos and videos used. Canelo vs. Chavez, Jr. is a 12-round fight presented by Golden Boy Promotions. The event will take place on Saturday, May 6 at T-Mobile Arena and will be produced and distributed live by HBO Pay-Per-View® beginning at 9:00 p.m. ET/6:00 p.m. PT. Next boxing news: Anthony Joshua – who will be next? Wilder, Pulev, Fury or Wladimir (rematch) ?